Courtney Gupta, a born and raised Ukiah native, has been part of the Downtown community since 2009. She served as her Student Council President at The California Academy – A Paul Mitchell Partner School and graduated top of her class in 2009. She quickly regained employment with Schat’s Courthouse Bakery as a cashier. In early 2010, Courtney gained a position at Toppers Salon, where she is currently a stylist and Salon Manager. 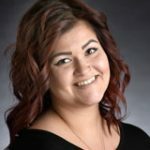 In 2018, she will graduate from Mendocino College with degrees in Business Management, Business Administration, and Accounting. Passionate about the Downtown community, Courtney became involved with the Main Street Program’s Promotions Committee in 2016. With encouragement from family, friends, and co-workers, she accepted a position with the Main Street Program’s Board of Directors in 2017. In her spare time, Courtney enjoys spending time with her boyfriend, Julian, her family, and her close friends. She also loves doing hair and has found a true passion as a hair artist. Courtney is looking forward to serving her fellow-merchants in the Downtown area and bringing the community together in a positive, fun environment.